MIAMI, Florida (CNN) -- Hurricane Bill blew toward land early Tuesday, edging closer to the West Indies with near 100 mph winds and the potential for developing into a major hurricane. Bill intensified and the National Hurricane Center expects it to strengthen over the next 48 hours. 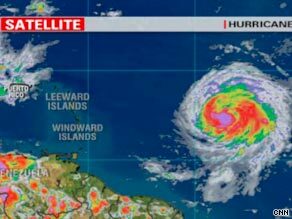 Various weather models showed the storm either missing or grazing the west side of Bermuda as it heads toward the U.S. East Coast, CNN meteorologists said Tuesday. Bill is the first hurricane of the 2009 Atlantic season. The remnants of Tropical Depression Ana continued to move across Hispaniola and Cuba on Tuesday, CNN meteorologists said. Forecasters expect Ana to wash south Florida in heavy rain as it passes through the Keys later this week. There's a slight chance that Ana could regenerate into a tropical cyclone later this week in the southwestern Gulf of Mexico.